These 100% carbon fiber shifter paddles replace your aluminum parts in about 15 minutes. Most aftermarket paddles are extended like the Stradale paddles on the "UP" paddle, but they leave the "DOWN" paddles short. We didnt like that look so we extended both so they are functional and also much better looking. We worked hard to get the correct Ferrari style weave carbon fiber for these parts. You will really be impressed by the quality! 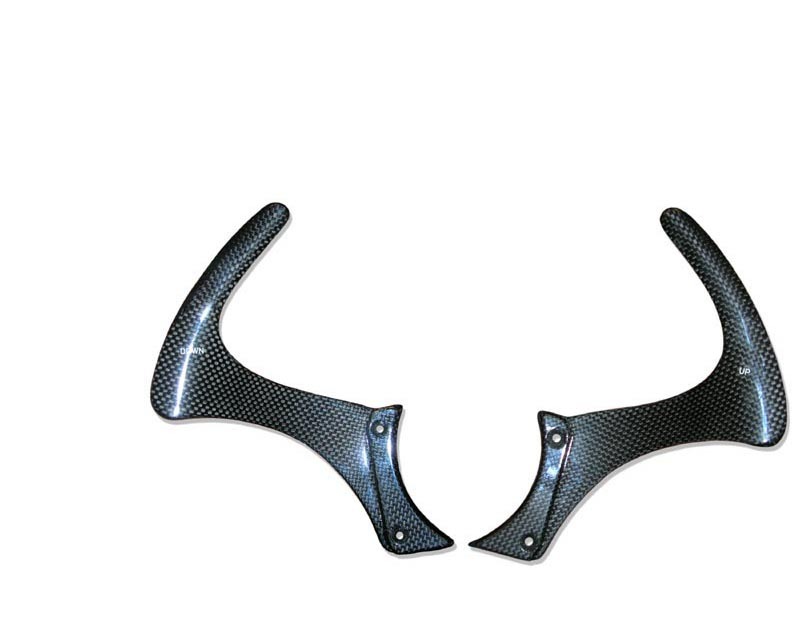 This carbon fiber part is manufactured by Elite Carbon and it is the finest part on the market. It is 100% carbon fiber and has no fiberglass or filler in it at all. The way Elite Carbon manufactures their parts is light-years ahead of the competition. The part is initially digitized into their computer system and the mold is made. The carbon fiber in the correct Ferrari weave is rolled out on a table where their computer cuts the carbon material perfect every time. No hand cutting here. This pre-preg carbon fiber is then laid into the mold in a numbered order to make sure each part is the same as the last one. The mold is vacuumed bagged in an autoclave. The part is then removed from the autoclave and the mold, then clear coated to a brilliant shine. This is the finest part you will find. This is a drop ship item and can take up to 3 weeks.